For me, a nightstand boils down to just a handful of items. You don’t want your nightstand to be so cluttered that it no longer functions. BUT you don’t want it to be so bare that it looks a little silly each time you pass it by on your way out of bed. All you really need is a light option AND some combination of the items listed below. You can add something from every category or just a couple. It’s as easy as that! Let’s start with the foundation: lighting! Lighting. This is a staple that pretty much every nightstand is going to need. 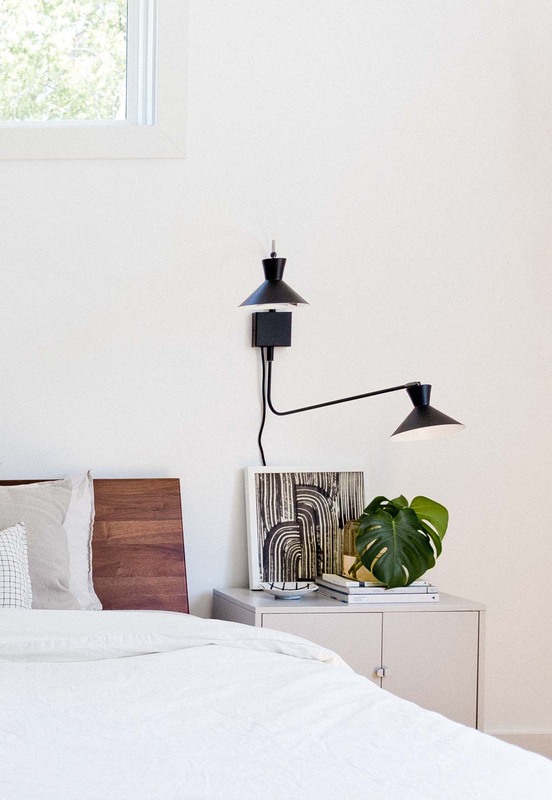 If you’re using a simple table lamp, this is as simple as positioning and plugging in. If you’re using a sconce though, like what I have in my master bedroom, this will take more than a few minutes to install. And if you’re going with a cordless sconce option, you may need to call an electrician. But Jeff and I were able to install these swing arm sconces on our own very easily. They’re from Urban Outfitters and called the Chelsea double sconce. Artwork. I am a big believer in artwork, everywhere! So why not have a small piece of artwork for your nightstand as well, whether it’s hanging on the wall or just leaning like mine. It’s a super quick way to add visual interest and depth to your bedside. I like to add a piece of artwork to ground the space right after lighting goes in. It creates a nice backdrop for everything else. 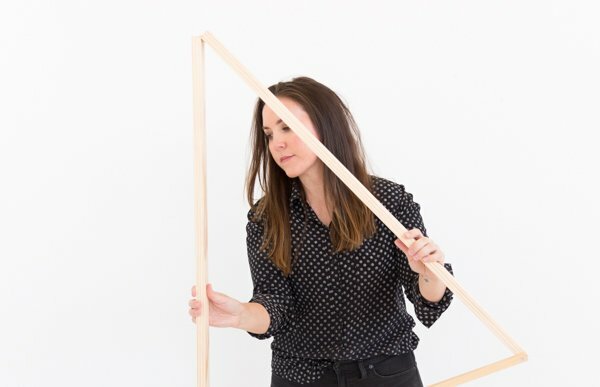 Not feeling the artwork idea? What about a mirror instead?! It will add interest and reflect light, which is especially nice for those dark corners. Books. What nightstand is complete without a handful of books. Whether they’re just for decoration or for actual reading, it’s nice to have a short stack of books on your nightstand for layering or even for adding a little pop of color if you can find books with a colorful spine. Something practical for storing small items. This could be a tray, a bowl, a small dish – anything that can house small things you might want to store on your nightstand. Jewelry, eyeglasses, cough drops, etc. You can see in the image at the top of the post (which is my side of the bed), I’m using a small dish in the same colors as my piece of artwork to tie the two things together, but with a different pattern so it doesn’t feel matchy-matchy. A natural element (like a plant or a small vase of flowers). When I roll out of bed every morning, it instantly brings a little smile to my face to see small plant or vase of flowers on my nightstand. Something decorative to add personality. 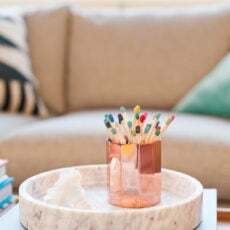 This one isn’t a requirement, but adding something small and decorative other than what I mentioned above (maybe a cool paperweight or small figurine) is a great way to add a final touch that brings in that extra little ‘something’ that makes it feel special. This could be as simple as a candle or trinket from your travels. In the photo below, which shows my husband’s side of the bed, I added a candle AND a small ceramic bust that I found at an antique store a few years ago. I love the quirkiness of that little sculpture! 1. Ground the space with lighting (and artwork if desired) and let those pieces be your guide for bringing in the smaller objects for styling. 2. 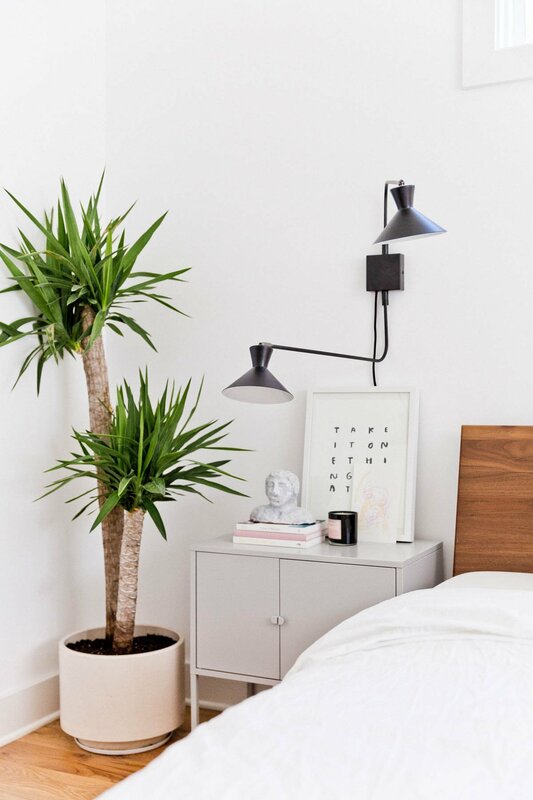 Remember to vary the heights of the objects you use on your nightstand to create a visually well-rounded space. 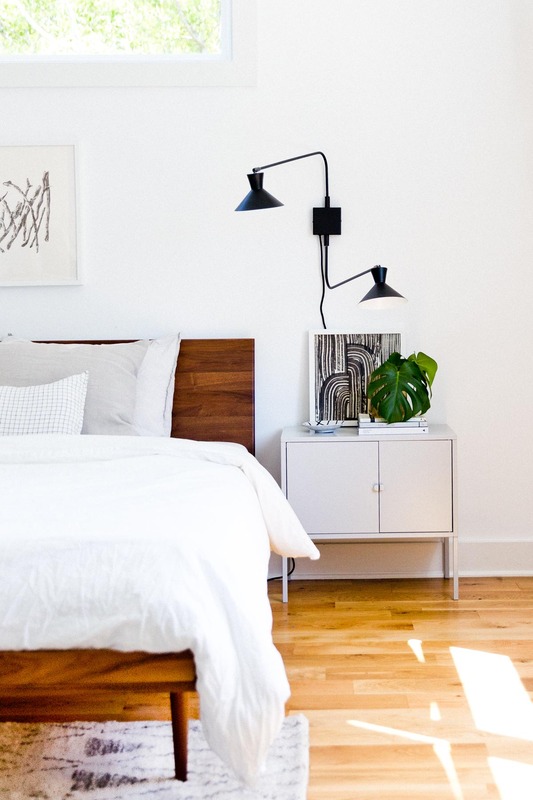 Nine times out of ten, nothing on your nightstand will be taller than your lighting or artwork. So start there and work your way down. 3. Using an odd number of objects is always helpful in making a space feel effortless and stylish. A stack of books count as one object btw. 4. If you have a super small nightstand, utilize the wall space! 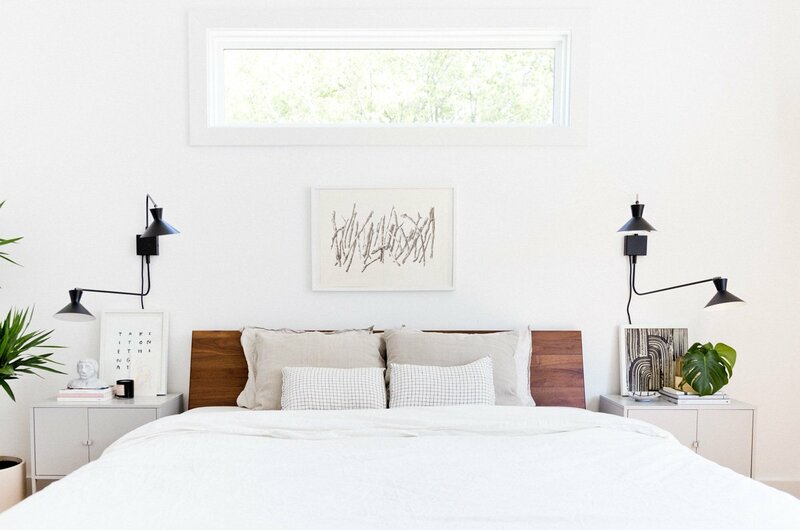 That’s where having a wall sconce for lighting and/or hanging artwork above the nightstand will really help. P.S. Our nightstands are from Ikea (it’s the LIXHULT cabinet and they’re $40 each). They were really just a placeholder nightstand option for us that turned into something we’ve had for the last 3 years now. Whoops! But they fit with lots of styles and have lots of hidden storage when you open them up, which is nice for storing the ugly stuff that doesn’t need to be out. What do you have on your nightstand right now? Let me know in the comments below. I like having few functional things around the house and avoid clutter as much as possible. Its also easier to clean if there isn’t a lot around. 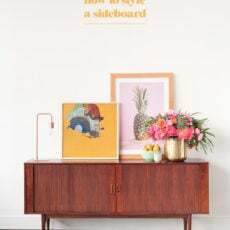 I like the idea appreciate with you about decorating the nightstand with natural elements like plant or vases of flower. It keeps your room freshen beside the decoration. Thank you for sharing. Really appreciate your idea. Very cool design and very elegant. These tips are perfect! My nightstand is styled with a lamp and some artwork and an old-fashioned alarm clock. I definitely need to add some books and greenery!